Spend 2 days getting up to speed on the growing and complex ways the two biggest retirement programs interact and impact retirees and pre-retirees. 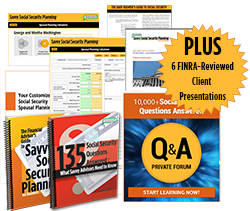 Get the important insights and tools to help you help your clients make the best Social Security decisions possible when planning their retirement income strategy. No client presentations/seminars necessary! 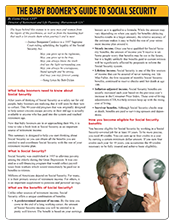 This 6-panel guide gives your clients a solid overview of how Social Security works. Perfect to handout at client meetings about retirement income planning. 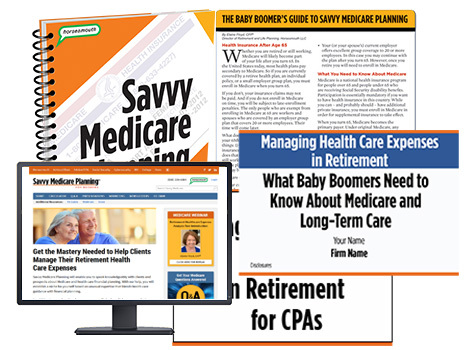 Elaine Floyd, CFP®, Horsesmouth’s Director of Retirement and Life Planning, has worked to develop this client-resource on Medicare—one that addresses the basics, but also dives into the more advanced aspects of a complicated topic. Sometimes you just gotta toot your own horn! Because clients will forget how valuable you are. They don’t see the behind-the-scenes activities. They don’t realize all that goes into the check they get each month or the hours spent reviewing accounts. 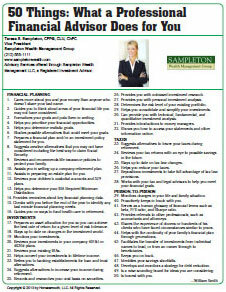 So remind them of your value with this special reprint, "50 Things: What a Professional Advisor Does for You." Who wouldn’t want to hit the $1 million mark and beyond if the path was clear? In this detailed account of how she did it, Debra Taylor, CPA/PFS JD, shares the specific steps she took to build her business serving High-Net Worth clients. 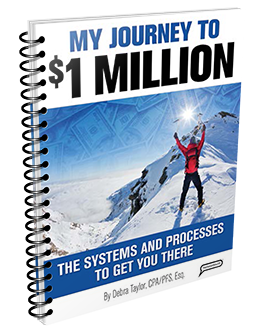 My Journey to $1 Million: The Systems and Processes That Get You There is an exclusive guide that will provide you with the systems and processes you need to implement in your business to grow it to the level you desire, even $1 million and beyond. Stop wondering about how to do it and learn from an advisor who succeeded in turning her business around. Who will show your clients how to fight the growing cybersecurity threat? It should be you—their financial advisor! 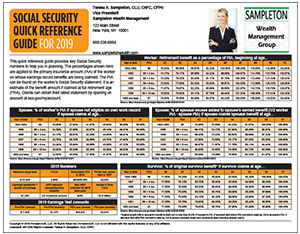 This two-sided reference card allows your clients and prospects to quickly measure their current cybersecurity knowledge gap. Then it provides specific actions they can take to quickly boost their security and protect themselves, their families, and even their jobs. This two-sided, customizable checklist is the perfect resource for your business owner and executive clients. It’s designed to guide them through cybersecurity conversations with important business associates such as their IT team and CFO. 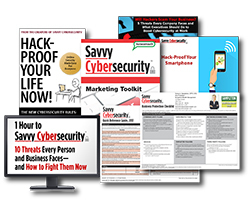 The goal of the Savvy Cybersecurity Business Protection Checklist is for business associates to share information, identify problems and strengths, and take action. 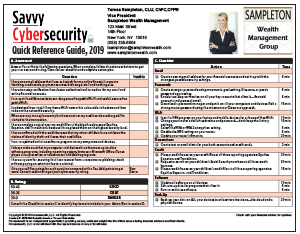 The checklist contains 40+ questions covering eight different cybersecurity topics, such as cybersecurity plans, data protection, employee policies, networks, and fraud prevention. 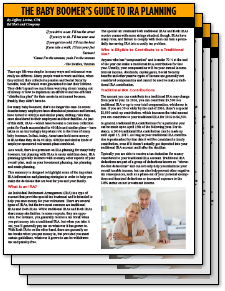 Get the Mastery You Need to Help Clients Manage Their Retirement Health Care Expenses! 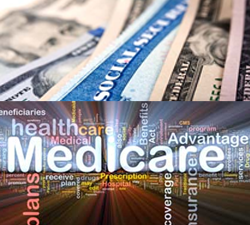 Speak knowledgeably with clients and prospects about Medicare and health care financial planning. Open up new areas of discussion with clients, prospects, and centers of influence. Deepen your relationships with clients by helping them with this complicated and important part of their retirement plan. Deliver excellent service by providing information, resources, and guidance geared to each client’s unique circumstances. 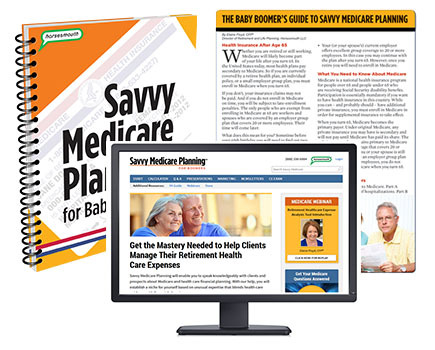 Get the important insights and tools to help you help your clients make the best Medicare decisions possible when planning their retirement income strategy. No client presentations/seminars necessary! 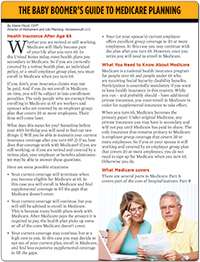 People need concise, objective and easy to understand information about Medicare and Obamacare. Now you can give them just that with the Healthcare Quick Reference Guide. 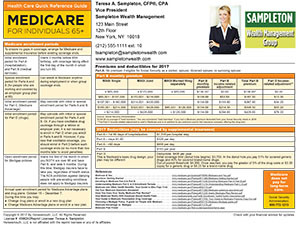 This branded 8.5" X 11" reference has Medicare information on the front and Obamacare details on the back. Each side includes critical information about which programs apply to which people; when to apply, information about premiums and deductibles, and references to other resources with more information.